You can track the progress and see what rewards members are redeeming with their points. These insights will allow you to monitor your reward options and see how your members are using them. 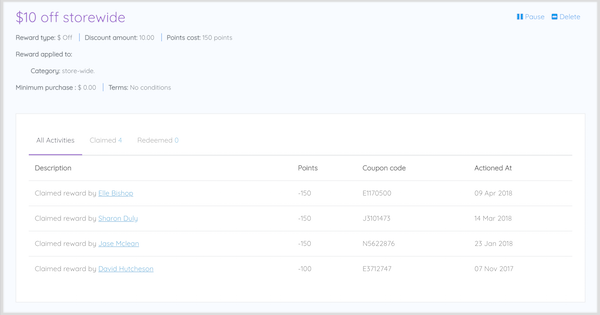 On the Rewards page, you will see a basic overview of your current rewards, including their point costs and how many customers have claimed and redeemed them. This will open the insight page for that reward. Claimed: Claimed refers to when the member spends their loyalty points in your widget to get the coupon code. Redeemed: Redeemed is when the member actually uses their coupon code at checkout.